What a busy year! 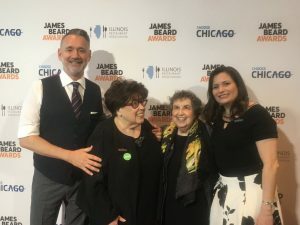 The spring brought The Food Flirts with the Brass Sisters to NYC for the James Beard Foundation Media awards. 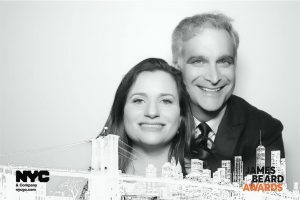 Our show was nominated for best show shot on location, and while we didn’t win our category, it was truly a privilege to be in such rarified company. We all felt the love in the room and beyond. 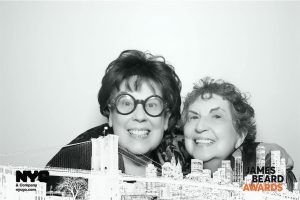 We saw lots of old friends, made some great new ones (Marilynn is gazing at, and about to meet, Jeremiah Tower off camera! ), and of course we enjoyed outstanding food. 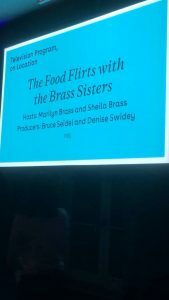 We just relaunched The Food Flirts nationally on July 6, with PBS rolling out our new episodes back-to-back on the first three Friday nights in July from 10-11 p.m. nationally in many markets, (but please check here for broadcast info. in your area as days and times vary city to city). Let the adventure continue and thanks for tuning in!! © Copyright Denise Drower Swidey | Culinary Producer | Writer | Food Stylist. Denise Drower Swidey | Culinary Producer | Writer | Food Stylist Theme by ThemeJug.